ZELDA is a Zernike wavefront sensor designed to measure low-levels of instrumental aberrations in near-diffraction limited high-contrast imaging instruments. The concept has been implemented and validated in VLT/SPHERE, where is is now used to monitor the temporal evolution of the aberrations of the instrument. A public analysis code, pyZELDA, is available on GiHub. High-contrast imaging of exoplanets on large telescopes requires extremely low-levels of instrumental aberrations to reach the highest possible rejection of the diffracted stellar light using a coronagraph and to minimize the residual speckles in the focal plane. These speckles are the main limitation when it comes to the detection of faint, self-luminous planets at angular separation a fraction of an arc-second. To reduce the level of quasi-static speckles, it is necessary to minimize the instrumental aberrations, e.g. by measuring them with a wavefront sensor and compensating them with a high-order deformable mirror. However, any extreme AO system (ExAO) will be intrinsically limited by the differential aberrations between the sensing path and the science path (e.g. Fusco et al. 2006). These so-called non-common path aberrations (NCPA), and their temporal variation over timescales from a few seconds to several hours, result in a degradation of the wavefront downstream of the ExAO, which will limit the ability to detect faint planets in the focal plane (Soummer 2007). ZELDA (Zernike sensor for Extremely Low-level Differential Aberrations) is a Zernike wavefront sensor designed to measure low-levels of NCPA with sub-nanometric accuracy in near-diffraction limited optical systems (N'Diaye et al. 2013). It uses a simple pinhole phase mask in the focal plane, with a diameter approximately equal to the diffraction limit of the system and a dephasing of π/2. The interference between the part of the wave dephased by the pinhole and the part not dephased will transform phase aberrations into intensity variation in the relayed pupil plane. In the small-phase regime, there is a linear relationship between the intensity in the pupil plane and the phase aberrations, which enables to reconstruct the aberrations of the system. In 2015, we obtained data in VLT/SPHERE on the internal source to test and optimize this sequence, and validate the performance of the ZELDA sensor for the calibration and compensation of the NCPA (N'Diaye, Vigan et al. 2016). 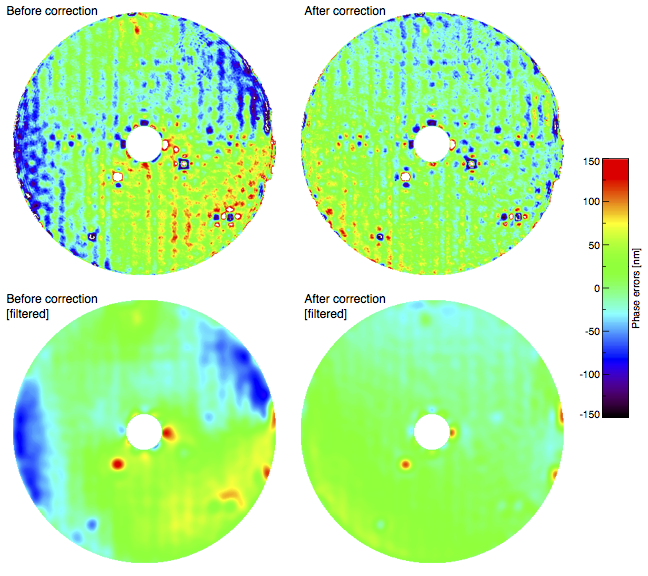 As illustrated below, the validation was completely successful: we managed to decrease the amount of NCPA by a factor of more than 2, falling under 20 nm RMS of internal aberrations in the range of spatial frequencies that the SPHERE deformable mirror can correct. The result of the NCPA compensation is perfectly visible in coronagraphic images acquired on the internal point source. The correction enables visibly decreasing the amount of speckles within the correction radius of the ExAO system, and particularly at close separation from the coronagraph (3-6 λ/D), which is where we desperately need to improve the performance to detect more planets. The gain measured at 0.1" is of the order of a factor 15. ZELDA is now used every day to monitor the internal aberrations of SPHERE, but the next step is to use this correction of the NCPA on-sky to improve the detection capabilities of the instrument. Preliminary tests performed in March 2017 did not show a major improvement of the raw coronagraphic performance on-sky when compensating the NCPA measured by ZELDA. However, this result could be expected because there are several differences between the internal source and the sky configuration: amplitude defects of the telescope, chromatic beam shift, rotating optics, etc. New tests to characterize the limitations are foreseen in 2018, e.g. in the context of HiRISE. The cophasing of segmented telescopes at very high-accuracy is an important problematic for high-contrast imaging on Extremely Large Telescopes (ELTs) or future space-based observatories like LUVOIR. We have already demonstrated the power of a seeing-limited Zernike wavefront sensor for segment phasing with the instrument ZEUS (Dohlen et al. 2006; Surdej et al. 2010; Vigan et al. 2011), which was developed at LAM and validated in the Active Phasing Experiment (APE, Gonté et al. 2006). The next step is investigate the performance of ZELDA in a segmented high-contrast imaging system. First simulations (Janin-Potiron et al. 2017) and laboratory tests with MITHIC (below) are extremely encouraging. The next steps will be to investigate the performance in presence of residual turbulence corrected by an ExAO system. Main collaborators: Mamadou N'Diaye, Kjetil Dohlen. Other collaborators: Jean-François Sauvage, Julien Girard, Jean-Luc Beuzit, David Mouillet, Gérard Zins, Thierry Fusco, Markus Kasper, Patrice Martinez.